They're occupying Parliament House until he shows up. Well, those school students striking for action on climate change promised that last Friday’s massive protests were just the beginning, and unlike our politicians, they’re following through. This morning a group of students from around the country travelled to Canberra to talk to Scott Morrison about the pressing issue, only to find that the Prime Minister didn’t show. 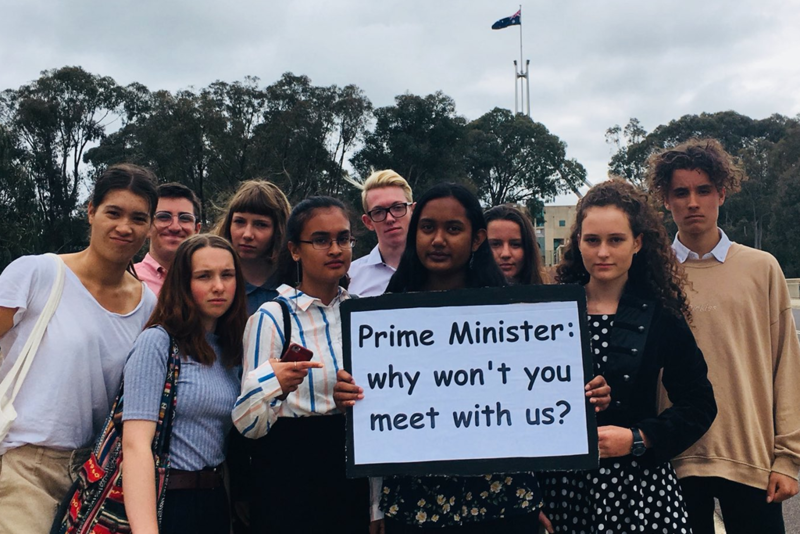 A small group of students travelled to Canberra this morning after spending a week attempting to get in touch with the Prime Minister for a meeting. They came from all around the country — one student actually travelled there from Townsville in far north Queensland — and said they decided to show up in Canberra in person because they hadn’t had much luck getting Scott Morrison on the phone. Actually, they say Scott Morrison’s office has been hanging up on them, multiple times. Ed Krutsch, an 18-year-old student from Melbourne, told Junkee the students have been calling Scott Morrison’s office for over a week asking for a meeting, “but unfortunately, he failed to get back to us”. The students have called the Prime Minister’s Office at least ten times this morning, and say they have been hung up on three times. The Prime Minister’s Office told Junkee they have been answering the phone following their normal processes, and said they have not been hanging up on kids. The students say the only time Scott Morrison’s office responded to their requests for a meeting was yesterday evening, when the Prime Minister offered to meet with one student from his electorate, who was in Sydney at the time and could not reach Canberra on such short notice. The students who were available in Canberra tried to contact the office to arrange to meet with Scott Morrison in that student’s place, but couldn’t get through. A couple of MPs did find a few minutes to spare to meet with the students, though. Newly elected Member for Wentworth Kerryn Phelps met with them outside Parliament House this morning, as did Greens senator Jordon Steele-John. The kids aren’t giving up yet, though. 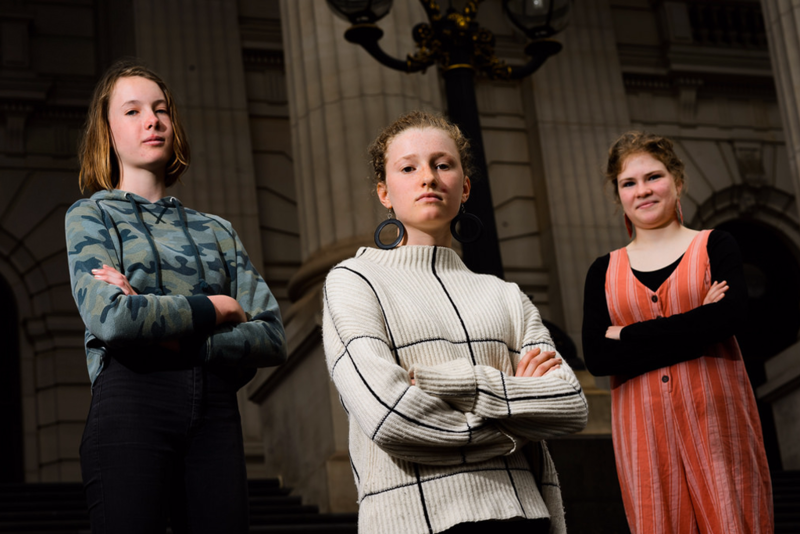 A coalition of around one hundred students, climate activists and Indigenous leaders have joined forces to occupy the foyer of Parliament House until the Prime Minister pays attention. They’ve published a list of demands, which are very straightforward: they want a commitment to no new coal projects (including stopping the Adani mine), and a commitment to transition Australia to 100 percent renewable energy by 2030. A spokesperson for the Prime Minister’s Office suggested the busy final week of Parliament may have been the reason for the Prime Minister’s failure to meet with the school strikers, and noted that the Prime Minister had offered to meet with students from his electorate. We reached out for further comment on why Scott Morrison did not offer to meet with the students who had travelled from across the country to see him, but we did not receive a response by time of publication. We’ll update this story if we hear back from them.